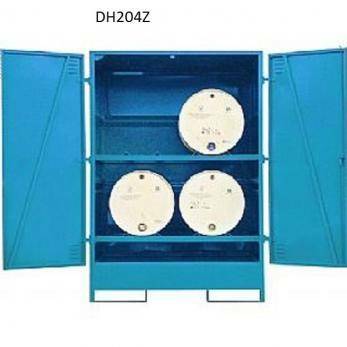 A range of fully welded horizontal steel drum stores for use outside or where secure , dry storage is of importance. This range is compliant with Oil Storage Regulations ( England ) 2001. Vertical units are fitted with galvanised grid floors with an adequate sump capacity for retaining spills. The Drum Stores are attractively finished in Blue and come with a generous 3 year guarantee for your peace of mind. Please note: that a forklift will be required to unload these units.